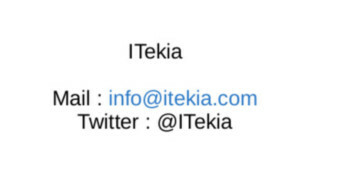 ITekia is a vendor-independent information security consultancy with over 5 year's experience. ITekia offers a security approach aligned with our large and middle size organizations control needs, helping our clients identify and mitigate their IT risks. One of the foundations of ITekia approach is to advise light implementation solution, leading to reduce IT risks without impeding organization operations, or cumulate users constraints.